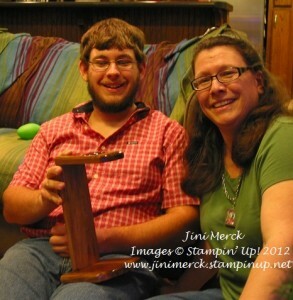 Have you been wanting to try your hand at stamping and see all the wonderful products Stampin’ Up! has to offer? If so this event is for you. Now through the end of March I’ll be offering Free Card Friday – Card Making Basics. Yes, I said FREE! Bring a friend and create two beautiful cards that you’ll be proud to give someone special! This class is for YOU! If you are new to card making, haven’t done it in a while or just want to have fun with your friends! Come fall in love with card making – you’ll be so happy you did! Today’s swap from Leadership was made using the P.S. I Love You stamp set. Fellow Demo Lynn Anderson used our Big Shot and our new Adorning Accents Embossing Folder to give her card a lot of texture and interest. I really like all the images in this set because the images are great for punching. That makes cards very easy to do for a large group. But P.S. I Love You isn’t just for Valentine’s Day it is also wonderful for weddings and anniversaries too. Can you believe it is almost the end of January and I haven’t shared with you the swaps I got during Leadership 2012! With Valentine’s Day just around the corner I thought I would share some of the wonderful P.S. I Love You swaps that I received. Today’s swap made by fellow stamper Adriana Benitez uses the P.S. I Love You stamp set from our Occasions Mini Catalog along with some of our FREE items that you can get during Sale-a-bration. 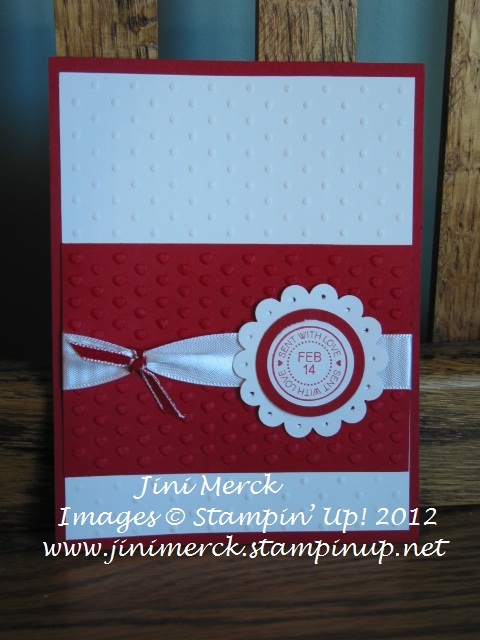 Can you see how she used the two FREE Big Shot Embossing Folders on this card? Both these Embossing Folders are part of Sale-a-bration and can be earned for FREE when you place a $50 purchase during Sale-a-bration! I just love the P.S. 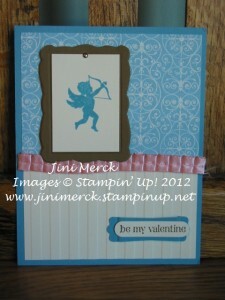 I Love You stamp set from the Occasions Mini it is so versatile. I’ll be sharing more great swaps with you that show just how easy the P.S. I Love You stamp set is to use! 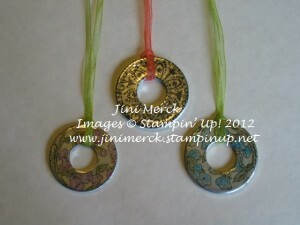 New Washer Necklace Class Being Offered! 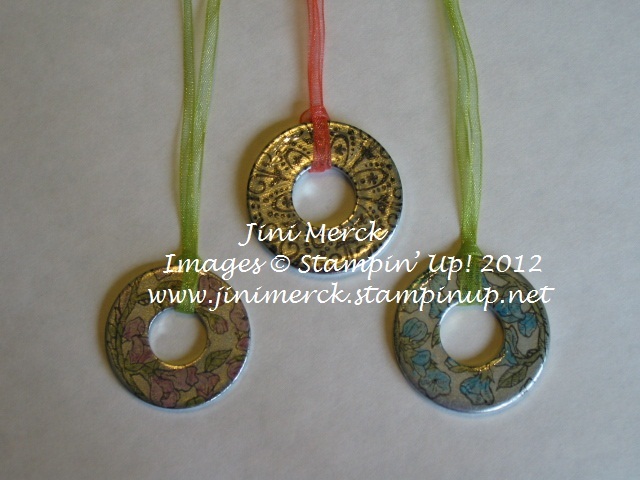 During this class you’ll learn how to make these delightful Washer Necklaces and make two different gift holders. They make wonderful gifts for yourself or someone special. All supplies are included except Snail adhesive. Wednesday, February 29th at 7 p.m.
Saturday, March 3rd at 10 a.m.
It’s that time… Sale-a-bration 2012 Starts Today! brochure … remember there’s no limit to the free items you earn. Party Guests & Individual Orders – Get to choose one free product from the Sale-a-bration brochure for every $50 spent (before tax and shipping). Hostesses – If your order reaches $150 you get a darling tote bag and if your order reaches $400 you get an awesome bundle of coordinating stamps, Designer Paper, ribbon and brads. Check out page 3 of the Sale-a-bration Brochure to see all the details. 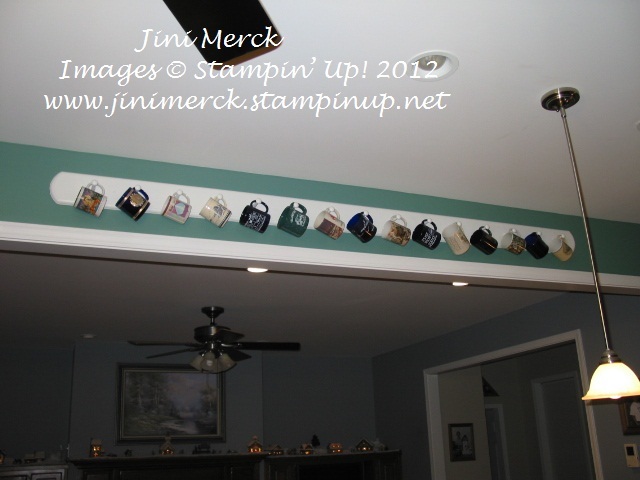 When ordering online …please make sure you go through my Stampin’ Up! Website…so that you get the hostess benefits too. This is in addition to the regularly fabulous hostess benefits! Want to schedule your own Sale-a-bration party? Just contact me and we can set up a date and time to have a private party with your friends and family. If you’re thinking about joining my team and becoming a Stampin UP Demonstrator ….the Starter Kit is $125 and you get a FREE Paper Pack or a Digital Download every month for the rest of the year. Click HERE for more information. It’s a great time to become part of my team! I’ll be holding my first team meeting on February 9th so you can check out what it’s all about, just call or email me for more information about my Team meetings. Here are my Take It to Heart washer necklaces and the last of my Leadership swaps. I always like to make a 3D item for swapping and as I’ve mentioned before I love the bird image from the Take It to Heart stamp set. I’ve wanted to try these little washer necklaces since I saw them sooo…. I used the Take It to Heart stamp set and made these in both in a pink version and a blue version. 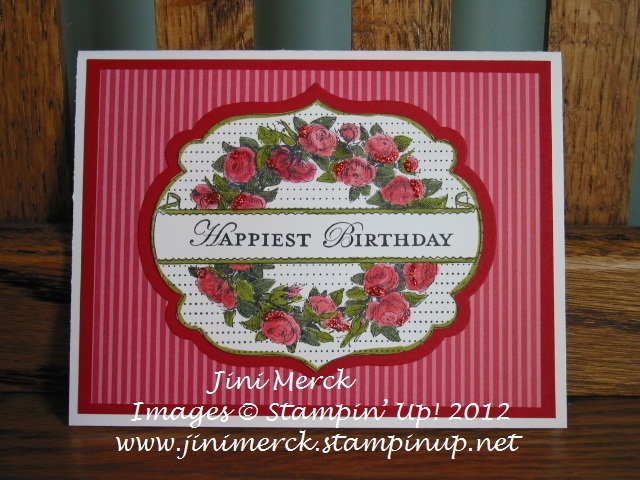 I also made one using the Mixed Bunch stamp set which I thought turned out very cool too. My daughter, who I use as my stamping critic, since I can always get a very honest response from her, thought these were so cool she wanted to give them as her Christmas gifts to all her girl friends – Since they were such a hit with Kaitlin I knew I had to make these for one of my Leadership swaps. If you would like to learn how to make these Take It to Heart Washer Necklaces yourself I’ll be giving a class on them next month. Check back in the next couple of days. I’ll be posting more information. 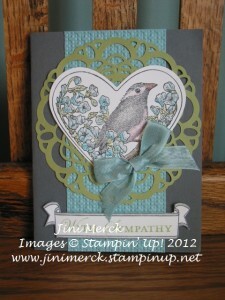 Today’s card uses the Apothecary Art stamp set from the Occasions Mini Catalog and is also one of my Leadership swaps. It’s one of my favorites from the new Occasions Mini and with the coordinating Labels Collection Framelits Die I just couldn’t resist! Apothecary Art comes with two sentiments but you can also use the Loving Thoughts stamp set with it too which makes it a great stamp set for card making for all occasions! I’ve gotten such a great response to my son’s Heat Tool Holder that I told you about in my January 10th Blog post (you can see the post by clicking here) that he is now selling them. He is happy to ship also if desired. 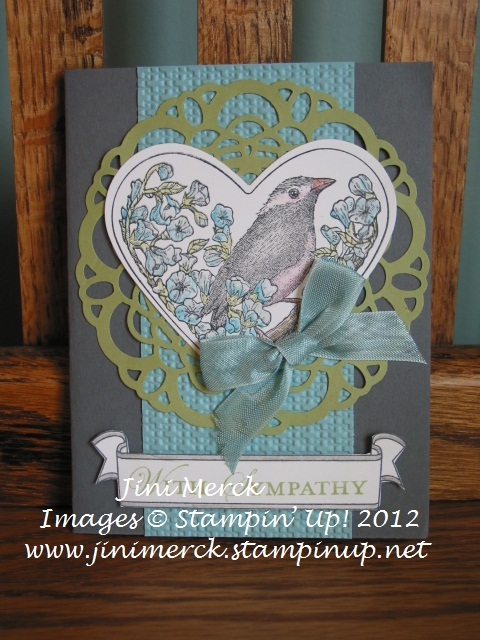 I love the bird image from the Take It to Heart stamp set and of course our new coordinating Framelits from the new Occasions Mini Catalog don’t you? So I definitely wanted to use it for at least one of my swaps for the upcoming Leadership Conference in Texas that starts on Wednesday. Soo… This week I’ll be sharing with you some of my swaps that I made for Leadership. I haven’t posted lately since I have been working feverishly on them to get them finished in time. Once again I didn’t start early enough since I couldn’t make up my mind which designs I wanted to make. Here is the first card I decided to do. It took me a while to come up with the design but I was very happy with the end result and the guys in my house thought it makes a nice masculine card too which is always a plus. 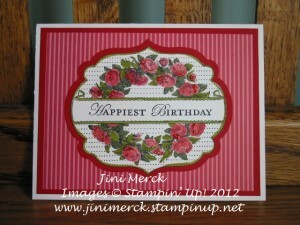 My card uses the Take It to Heart stamp set, Paper Doily Die, and the Hearts Collection Framelits Dies. Don’t you just love all the new coordinating products in the new Occasions Mini? I knew I just had to have the Loving Thoughts stamp set for the sentiment when I saw it– it is just so versatile and is great with the Take It to Heart sets banner. I chose to make a sympathy card this time. I’d love to hear what you think – Leave me a comment and let me know. If you didn’t get a copy of your own Occasions Mini Catalog just email me at stampwithjini@gmail.com with your name, address and phone number and I’ll be happy to send one out to you. Look at my new Heat Tool holder! Do you like tools and organizing to help you in your paper crafting? I know I do and I’ve had a wish list that has been growing along with my love of stamping. My son, Johnathan, who enjoys stamping, was trying to come up with ideas for me for Christmas because his funds were limited. He has been spending a lot of time in the work shop since landscaping is slow right now. He’s been playing with his “toys” during his college break and came up with some wonderful gifts for Christmas that have been on my list for awhile. I thought I would share them with you today. Forgive me for “bragging” a bit – I’m a proud mom. First is a non stamping gift – it’s a coffee mug holder for my kitchen wall. I’ve been collecting coffee cups since my first school trip to Germany in high school and so have quite a collection from the different places I’ve been over the years. His last gift was a ribbon holder for my desk. 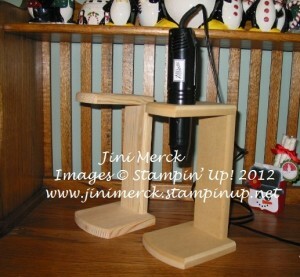 He is still “tweaking” this design a bit before he makes it into a wall unit for me but so far it is working great!